The end of this week (March 15) marks the cut-off for scientific papers if they are to be cited in the Working Group I contribution to the forthcoming IPCC Fifth Assessment Report, due in 2014. Unless the papers are published or accepted for publication the report cannot refer to them. The final expert review of the draft document ended on November 31, 2012, some 15 weeks ago. But according to IPCC procedures, the draft document can still be modified to accommodate new papers. You might reasonably wonder what’s going on, especially when the IPCC claims that its report is comprehensively reviewed by experts. To borrow the catch phrase beloved of ads for “miracle” knives and so much of the other schlock merchandise sold on late-night TV: but wait, there’s more! According to IPCC critic Donna Laframboise, scientific journals recently have been releasing special editions that focus on climate matters, with IPCC authors as their “guest editors”. These publications therefore provide material the IPCC report can cite without the text being subjected to scrutiny by its reviewers — including, perhaps, last-minute papers that knowingly fill shortages of references in some areas of the report. Significant changes after final expert review is common with IPCC reports. The 2007 report had several small but important changes, such as alterations to graphs to give different impressions of trends. The most blatant of all late changes was a significant re-write of the key chapter in the 1995 report, which specifically blamed human activity for boosting global temperatures. Do IPCC authors write their own convenient papers? In his book, published in 2002, former IPCC chairman Bert Bolin described how he and the chairman of Working Group I, John Houghton, authorised last-minute changes to the key chapter in order to accommodate the views of a new paper, purporting to show a clear human influence on climate, that had been submitted to a journal but not accepted at that stage for publication. Bolin said that the paper was written by several people, including a global expert on climate matters, but he notably failed to explicitly state that this person and several other authors of the paper were all involved with the writing of that very same IPCC key chapter. Imaginations don’t have to be stretched too far for the suspicion to arise that the IPCC authors were running short of material and wrote themselves an additional paper to cite. Late changes to text are not the only reason to consider that the IPCC is not the squeaky-clean, independent and authoritative voice on climate matters its advocates and defenders would have us believe. The IPCC’s charter directs it to examine only human-induced climate change, which is assumed to exist and to be a threat. It has no charter to examine other plausible causes of variations in climate and would be beyond its remit were it to do so. Its true function is to provide material that supports the assumption and to advise on mitigation (i.e. restraining rising temperature) or adaptation to a hotter world, which is taken as a given and regarded as inevitable. Understandably, prescriptions for mitigation describe methods that oppose the manner in which human activity is claimed to influence climate — replacing fossil-fuel power stations, for instance, with wind turbines and their unreliable like. Incredibly, governments have been fooled into accepting the fallacy of IPCC omniscience and have legislated according to the unproven claims of this biased organisation. The IPCC has been reluctant to admit that a warmer climate would be very beneficial to some parts of the world, especially the current fringes of arable land in the northern hemisphere. If winters were a few degrees warmer, food production in Canada, northern Europe and northern Asia would help feed the expanding global population as well as reduce the thousands of lives lost to cold weather. The IPCC seems locked into the environmentalists’ position that any change whatsoever is necessarily a bad thing. The IPCC’s primary activity is to summarise literature — usually, but not always, peer-reviewed papers that reinforce the opinion that man-made warming is significant, or papers to support arguments for countermeasures. There’s no indication whatsoever that it checks the credibility and accuracy of material it cites. When I reviewed the draft of the forthcoming IPCC AR5 I found numerous comments that claimed the ocean below 700 metres was warming, but not one comment explained how that warming could occur when basic physics says that warm water rises and that CO2’s radiation is absorbed within a few thousandths of a millimetre of the sea surface. There seems to be no impediment to IPCC authors citing their own papers. Forty percent of all papers cited by the crucial chapter of the 2007 report had at least one, and often more, IPCC chapter authors among the list of authors. IPCC authors promoting their own papers and causes — now there’s a novel thought! Verification of papers is absolutely essential because the only review they would have received is from the two or three experts engaged by the journal that published the paper. Few casual followers of the climate industry seem aware that the authors of a paper are invited to nominate as reviewers between three and five potential experts. It requires no great leap of logic to comprehend that no author who wants to be published will nominate anyone likely to be hostile. There are no guarantees that the journal will approach the nominated people, although such a course would definitely make a journal editor’s life easier. A pals’ review, followed by a citation in the IPCC report, is a win-win for authors and the IPCC. Failure to check data is another common symptom of the IPCC. There appears to be no evidence that the IPCC independently audits the temperature data it cites. I compared data from six national meteorological services against the HadCRUT3 station data. Only one country’s data matched — the USA. In another country differences of more than 5 degrees occurred frequently, and in another case it reached 12 degrees. The IPCC publicises the fact that expert reviewers comment on two drafts of the document before a final version is produced. It is more reluctant to tell you that, unlike peer-review for journals, where authors must meet reviewers’ demands, IPCC authors are obliged only to make a written response to each review comment. Reviewing the drafts is a futile and thankless task. No wonder as few as 32 reviewers commented on the second draft of one chapter in the 2007 report. Simply put, IPCC reviewers are essentially impotent because the authors are in full control of the document at all times. It’s not a case of the number of authors keeping each other’s worst impulses in check because any passage of text will almost certainly be the work of no more than two or three people — a contributing author or two offering text in a specialised area and the lead author for that particular chapter. The claim in the IPCC 2007 report that a human influence very likely caused significant warming since 1950 was merely the collective opinion of the number of people who could fit in a Toyota Prius. The assigning of a specific probability to the term “very likely” was pure fantasy because probability is driven by mathematics, of which there has been none in this situation. IPCC reviewers can’t challenge that assessment because it’s a subjective statement from people with a vested interest in supporting the notion. The wider IPCC is hardly likely to blow the whistle because that would undermine the perceived competence and standing of the organisation, along with the supposed justification for its existence. It’s appalling that the IPCC is regarded as an expert on all causes of climate change; worse that it is seen as the source of unbiased opinions when the specific focus spelled out in its charter is on identifying significant human influence and only human influence. It’s equally appalling that people who have been involved with the creation of the IPCC’s assessment reports and seen first-hand how it operates should cite it as an authority on climate issues. We can only wonder how much green ideology and climate careerism, with its emphasis on personal-income preservation and reputational enhancement, shape the end result. Whatever the driving force it’s not science at the forefront. John McLean was co-author with Chris de Freitas and Bob Carter of a paper that became the centre of controversy when submitted to the Journal of Geophysical Research. Their experience with the censors of science can be read here. That’s assuming warming kicks in again for some inexplicable reason but what if it doesn’t? What if the astrophysicists turn out to be right and there’s cooling to some degree over the next 30 yrs? Thing is in those cold periods, it’s not cold ALL of the time [everywhere]. Just that when it’s cold it’s really cold and prolonged [regionally], crops fail, people and animals die. There’s a glimpse of this right now in Europe and wider Northern Hemisphere vs heat in the Southern Hemisphere but the current situation is only a harbinger and not conditions directly comparable to a solar minimum (we’re currently just past a maximum). The real conditions that will develop for the coming solar minimum – whether similar to [early 1900s], Sporer, Dalton, Maunder etc – will be very different to the current climate regime and the only way to know what to expect from the respective scenarios is to study what was historically documented for each of them and relate that to current cold weather events in order to get a handle on what each scenario would produce in the decades to come. The link between sunspot numbers and wheat prices has been known since William Hershel in 1802 for example. I think it is high time everyone stopped fixating only on the warming scenario argument (will it just be a little warmer or much hotter?) and started presenting the full spectrum of future climate possibilities with the respective attendant mitigation and adaption strategies. The [significant] solar downturn commenced in 2013 so there is now no escaping a change of climate regime to one of the past minimums as a result, The minimum is predicted for 2042 and thereabouts so there is less than 30 yrs to prepare. Question is: how long will it take for the people that matter to acknowledge the risk? 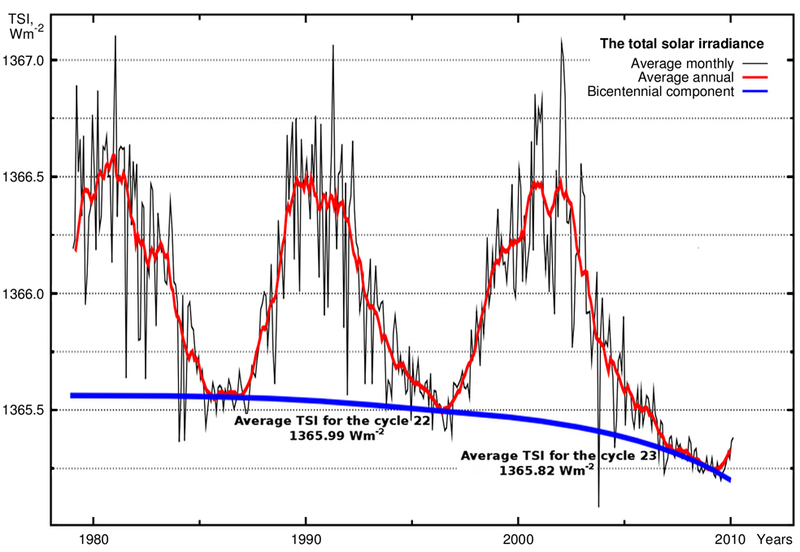 Even GHG-centric solar specialist (and IPCC author so his papers are automatically cited as best-in-class) pointed out in his 2009 report to the Royal Society (not Lockwood 2009 note) that falls in climate conditions from a solar grand maximum are relatively abrupt in comparison to the slow build up preceding a grand maximum. Lockwood also highlighted the fact that a significant change of solar regime was clearly evident in 2009. No amount of contra-solar argument written by the IPCC will have any consequence whatsoever in 2014 no matter how authoritative their “experts” are touted to be if the world-at-large can see a change to a cooler climate regime taking place from the current standstill. And if the early solar-driver becomes apparent by 2014, the question then becomes: how severe will the more significant slow (lagged) responses be when feedbacks take effect and the change gains momentum? Embarrassing for the IPCC too, that their CMIP5 GCM simulations out to 2100 are parameterized with solar levels unchanged from the early 2000s. Why, if it was known within the IPCC in 2009 (Lockwood) that a change was underway, didn’t they change the solar parameterization when they had the chance? Or would that have had the potential to dilute the message?